Courtesy of a reliable source evleaks, we just saw a couple of HTC One Max press renders showing AT&T branding in Twitter. 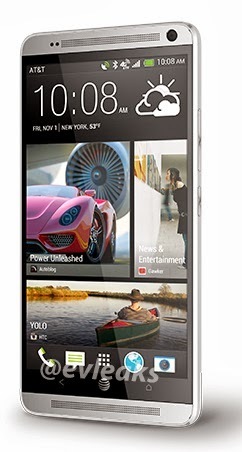 It suggests that the phablet might be available to 3 US carriers as Verizon and Sprint confirmed the news earlier. If the rumor turns out to be the case, the phablet will likely join AT&T’s already impressive smartphone lineup before the holiday shopping season kicks off. It will join the likes of the Samsung Galaxy Note 3 and the LG Optimus G Pro as an alternative for those looking for a large-screen device. The AT&T One max that's shown in this leaked shot appears to be fairly similar to its international sibling. AT&T has added a couple of its own touches to the phone, though, including adding its name to the status bar as well as its 4G LTE logo. HTC didn’t say anything about an AT&T HTC One model either, but considering that the HTC One is available from Verizon, AT&T, Sprint and T-Mobile, it would make sense to see quite a few of these carriers also pick up the HTC One Max in the coming months.